Photo courtesy of NSSL. Used with permission. 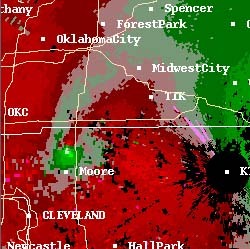 Doppler radar images of the F-5 tornado that swept away part of Moore, Oklahoma in the Oklahoma City area outbreak of May 3, 1999. The white line running north-south just east of Moore (to your right) is Interstate 35; the tornado is about to cross the intersection of I-35 and a smaller road at the Shields Overpass. 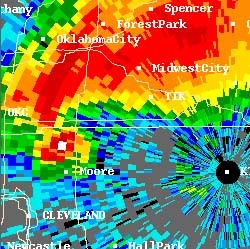 The picture on the left is a reflectivity image. The one on the right is a velocity display. Both images are produced by Doppler radar. The reflectivity image shows how hard the radio signal sent out is bounced back to the radar receiver. Rain and hail reflect this pulse more strongly than does “plain” air, so they make stronger echoes; the larger the droplet or hailstone, the more strongly the radar is echoed back to the receiver. Here, the white square is the region of highest reflectivity, and the orange on down through blue ones show progressively lower levels, and therefore less intense precipitation. In this particular case, the white areas probably show radar detection of actual debris within the tornado. Return to Intellectual Ways of Learning and Knowing About Tornadoes.